At first this review started out strong. It led with a bold and clear voice. I found myself captivated by the narrative, which seemed to draw the reader in with it's brilliant mastery of the written language. Such terms as "entranced by the subtle illustration in his colorful narrative" and "surprised at the depth of emotion he expressed in such a fact filled piece" led me to believe I knew what I was talking about. Once I was through the first paragraph, I was dazzled by the simplistic intro into the second. It was as if I dared to say out loud to any who would hear me "watch me carry this out as longer than you'd think possible!" There were twists and turns I hadn't seen coming, but I thought surely this would have to be the end. There was certainly no way I could continue this into a third paragraph. A joke is a joke I thought as I began the third. 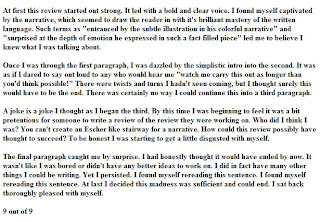 By this time I was beginning to feel it was a bit pretentious for someone to write a review of the review they were working on. Who did I think I was? You can't create an Escher like stairway for a narrative. How could this review possibly have thought to succeed? To be honest I was starting to get a little disgusted with myself. The final paragraph caught me by surprise. I had honestly thought it would have ended by now. It wasn't like I was bored or didn't have any better ideas to work on. I did in fact have many other things I could be writing. Yet I persisted. I found myself rereading this sentence. I found myself rereading this sentence. At last I decided this madness was sufficient and could end. I sat back thoroughly pleased with myself. You know if you ran all the words together and left out punctuation this could be Finnegan's Wake. @Cal Lol, that's silly funny. Ba ha ha! Classic. Good stuff. PS TS) Don't you love your readers enough to throw up a search box? For the love of cotton I can't find the rest of the Claus posts. I just put up the search box that blogger has. Not sure how good it works. But once you get into the clauses they should all link together. It worked! And not only did it get me there...it got me back here to see if you read my comment or if that search box had been there all along...I was feeling pretty silly for a minute. You're such an obliging young man. So guess this is as good a place as any (I'd email, but I hear you've lost your password)... I tried to vote for your blog on Bloggers Choice but I can't get past the registration...ARRGGHHH. I haven't lost my password. I'm not sure where you've heard that. I haven't checked my mail much today as I've been on blogger writing up my flood story. I'll be thankful for the vote, but I have no idea why it's not registering. Though come to think of it, that site has glitched up for me too. Sorry I can't be of more hlep on the subject. I misspelled help. That's like a bad joke. Reps@Stake started the password rumor...don't you read your own blog, man? Bad jokes are all I get.